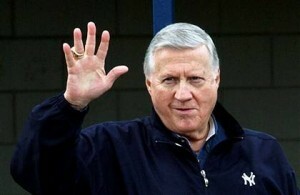 It is being reported that long time New York Yankees owner George Steinbrenner has suffered a massive heart attack. Steinbrenner just turned 80 on July 4th. Steinbrenner, the Bronx Bombers owner of the New York Yankees since 1973 has won 11 pennants and seven World Series titles. Reports from New York indicate Yankees owner George Steinbrenner has suffered a massive heart attack. Reports by WABC, the sister station of WPVI, indicate George Steinbrenner was rushed to St. Joseph’s hospital, and his condition is not known. Sadly, just the other day the long time voice, iconic PA announcer Bob Sheppard of the Yankees passed away. UPDATE I: Oh my, sad news to report in the word of baseball … George Steinbrenner, The Boss, has passed away at the age of 80 after suffering a heart attack. The Ohio born executive known as “The Boss” leaves behind his wife of 54 years, Elizabeth Joan Zieg, and their four children Hank, Hal, Jessica and Jennifer. Steinbrenner died around 6:30 a.m. Tuesday in Tampa, the source said. Although George was not the “nicest” person in the World, he was a great owner of a great sports franchise and I’m sure he will be missed amongst Yankee and baseball fans alike. How can anyone not forget Seinfeld…. So what? He played by the rules set up by MLB. They still have to go out on the field and produce. Do you not forget they were terrible during the mid to late 80′s and he turned it around! I love Yankee haters….can’t blame them like I said for playing by the rules. I kind of remember some team from Boston spending right up with them the past 10 years; winning two titles. My father was a die hard Yankee fan all his life. RIP Mr. Steinbrenner amd God Speed.